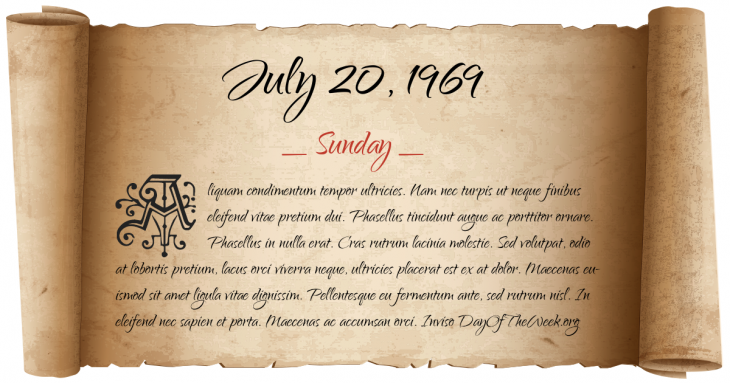 July 20, 1969 was the 201st day of the year 1969 in the Gregorian calendar. There were 164 days remaining until the end of the year. The day of the week was Sunday. A person born on this day will be 49 years old today. If that same person saved a dollar every day starting at age 7, then by now that person has accumulated $15,615.00 today. Here’s the July 1969 calendar. You can also browse the full year monthly 1969 calendar. A cease fire is announced between Honduras and El Salvador, 6 days after the beginning of the “Football War”. Apollo Program: Apollo 11 successfully makes the first manned landing on the Moon in the Sea of Tranquility. Americans Neil Armstrong and Buzz Aldrin become the first humans to walk on another world almost 7 hours later. Who were born on July 20, 1969?